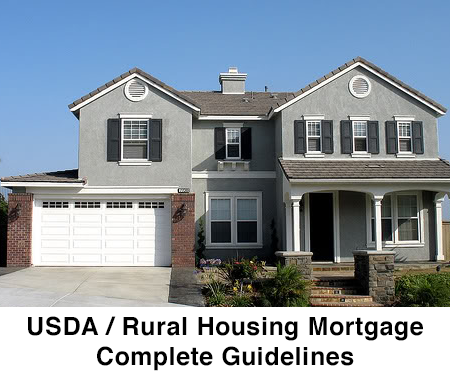 If you are looking for information about home loans for a home purchase, the rural housing mortgage through the USDA may be of interest. Like many others, you may not be familiar with the Department of Agriculture loan programs. However, this blog will assist with providing information so you can make an informed choice about a home loan. The aforementioned loan program is insured through the U.S. Department of Agriculture, and requires no money down, that is, 100% of the money necessary to purchase a home can be borrowed. Many other loan types require up to 20% down at the time the loan is made. If a family was interested in acquiring a $100,000 home loan, it could cost up to $20,000. However, the rural housing mortgage enables a family to obtain the $100,000 with no money down. This particular loan can be utilized by both first time buyers as well as move-up buyers. The Department of Agriculture has some of the lowest loan rates out there, which is helpful in keeping loan payments affordable for families. Eligibility is determined based on the borrower’s credit history, that is, the borrower has a proven track record of paying their bills on time. The credit history check for loans typically looks at a 12-month span of time to determine eligibility. So, if prior to the 12-month period, the borrower was late on payments, or other financial problems occurred, they are not taken into account. As long as the borrower’s credit history is solid over the past 12 months, they would be eligible for a Department of Agriculture loan. There are some income restrictions for rural loans, and borrowers should be aware of the income guidelines. A potential borrower will need to be able to provide proof of income. The Department of Agriculture generally requires at least two years of employment history or verification of ongoing income. However, it is important to note, there can be certain exceptions made for students. The eligibility application does not require proof of assets, however, being able to show assets assists with minimizing the negative impact of past credit difficulties.